So Today was the first Saturday in a long while that I didn’t have a Roping or Rodeo. That means I took the day off. Okay, so I didn’t really take a day off. 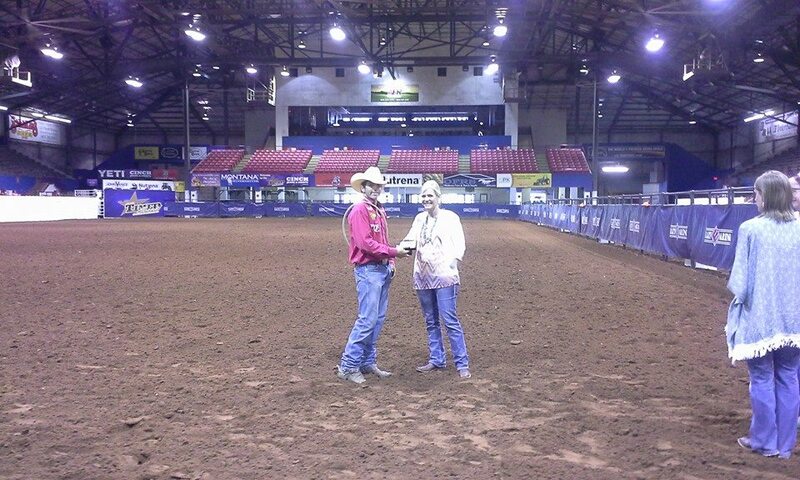 I started by getting in some roping on Ice. 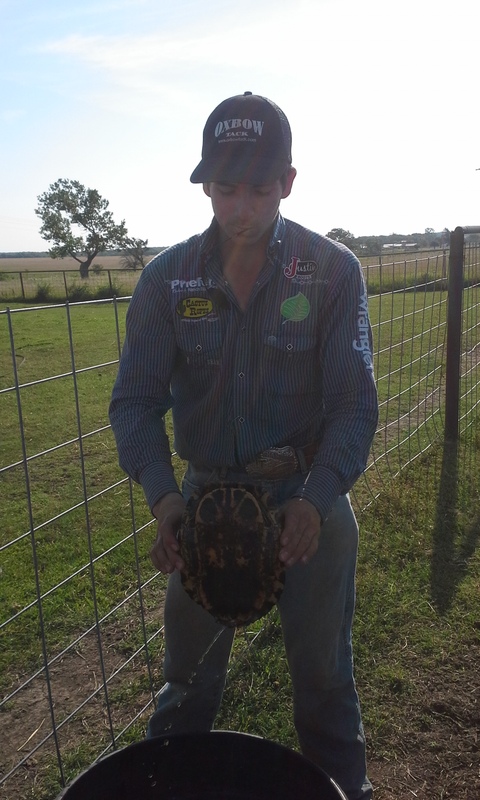 We even managed to Rope a turtle … LOL … It was huge (Huge for a turtle anyway). 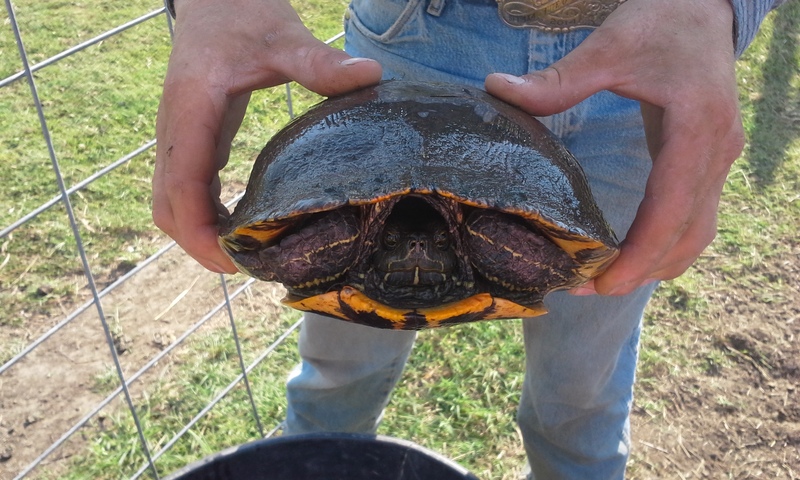 I kept him in the water troughs until Mom and I took him to a new home at the creek. 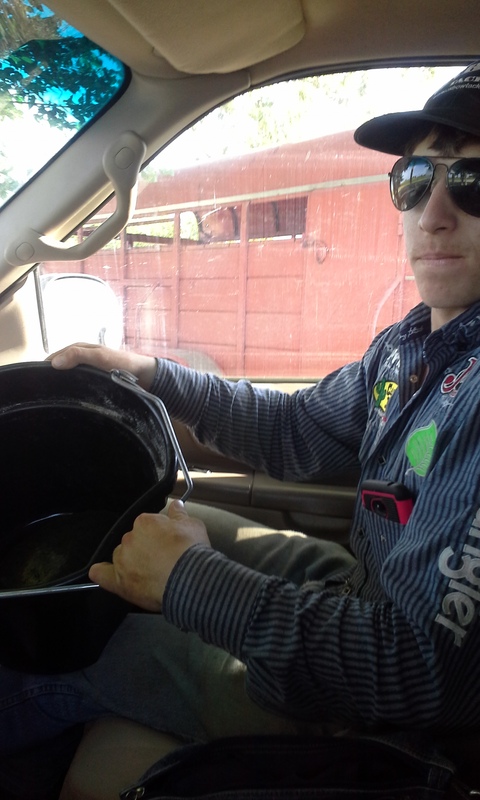 After I got done with the horses Mom took me down the road in the truck with my new friend in a bucket. I turned him loose and I am sure he will love his new home. 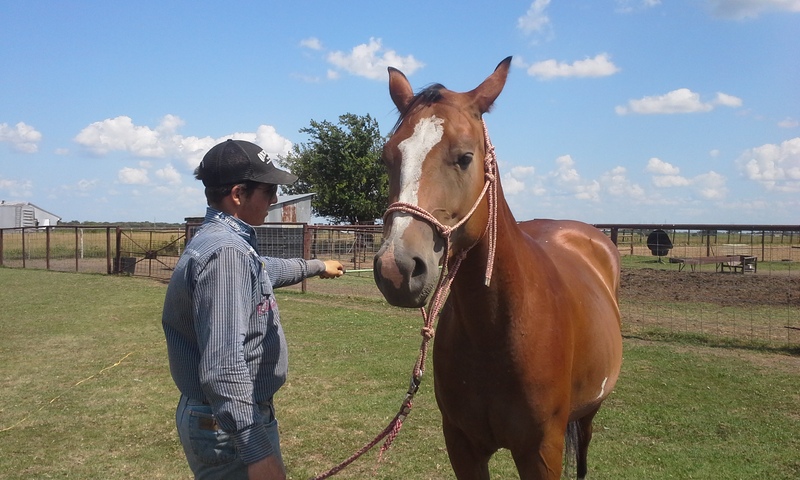 After that Mom and I worked with Caballo. 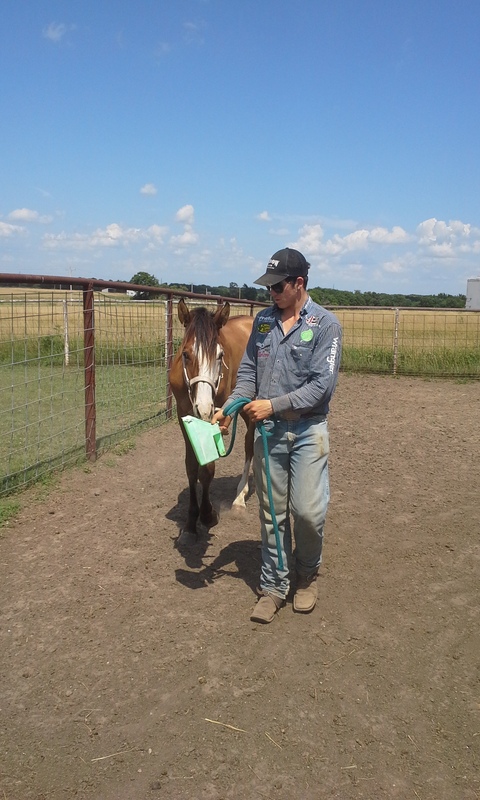 It took us a bit and with the help of the chutes we got his halter on him for the first time. After that I lead him from one pen to another with very little trouble. He is such a quick learner. I did teach him with Feed but that is only because he already follows us into the stall when ever we feed him. 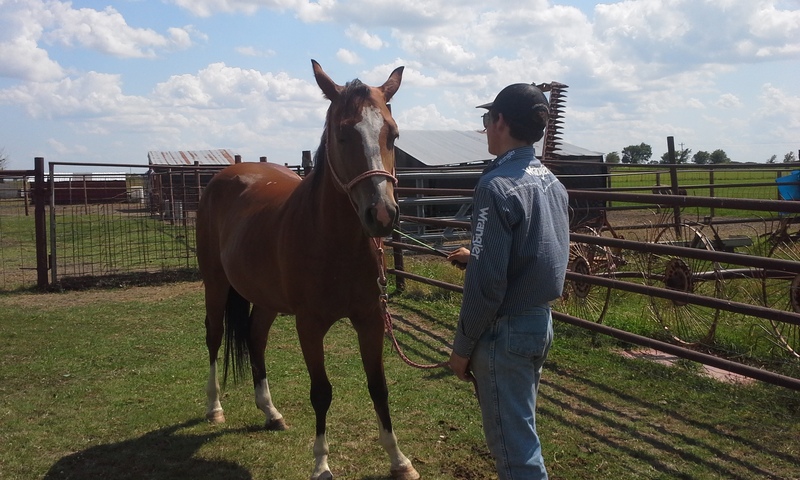 So to make it easier on him I used it to convince him he could move in that halter. After that Mom said it was time to work with Precious. We are introducing her to a new form of training. All we did was get her used to the flag today but she did great. At first she was spooky at everything. Then she settled in and seemed to catch on that it was going to be okay. She relaxed and let me do anything I wanted. By getting her used to the flag we should be able to start building her confidence a little at a time so that she will learn to trust again. So it hasn’t really slowed down around here. It has however seemed to get a bit crazy. There are still all the little things that I have to do daily but then some big issues have taken over. Coop is Doing much better because what we though was Dew Poisoning turned out to be a scuff from her metal shoe that took off a bit of hide and was oozing. Doc gave her some meds and she will be fine. Derf is still getting his feet all worked out but they are doing great. Holly is doing fine. 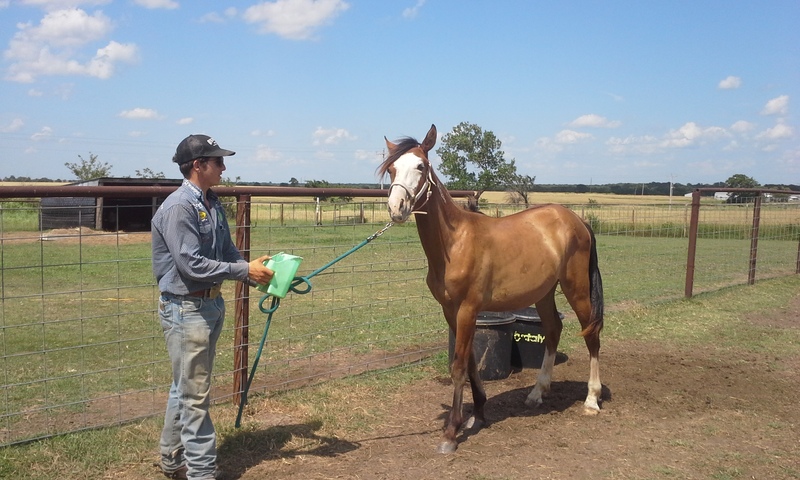 Rodeo is being weaned. 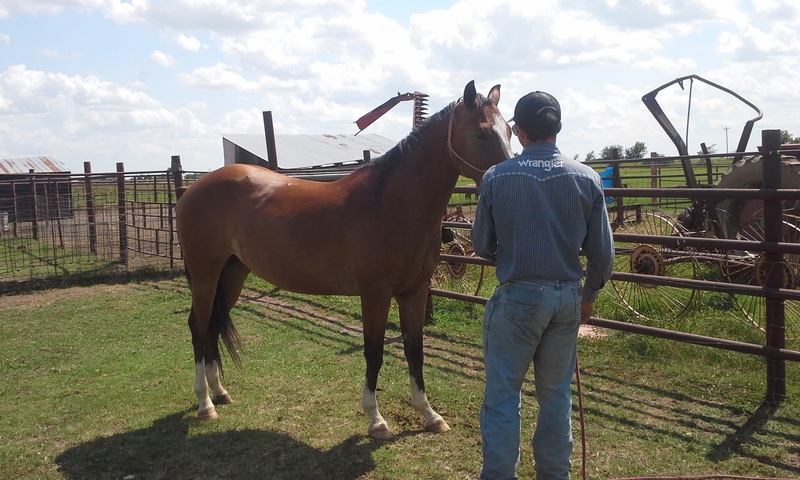 Precious is coming along and Storm is rocking the roping. Even with all that it is the big things that are getting in the way. It all started with the A/C having to be replaced. We put the window units in about a week and a half ago only to find that two no longer want to cool our house. Mom had to order one online that was 110v but big enough to cool the kitchen and some of the living room. We got that here Thursday and then Friday we had a large group of kids followed by a blown water heater. The water heater wouldn’t have been such an issue if #1 the old one hadn’t been installed in May of 1988 and #2 if it hadn’t been propane. You see in the country we don’t have natural gas and our only heavy wiring is for the stove and the dryer. That means we had to special order a Propane water heater. It cost us a bit more and to top that off the size of a water heater has grown in the last 28 years. That means the standard water heater is now 40 gallons and not 30. At least we got to shower BEFORE my State 4-H Horse show. It was yesterday (Thursday). What was suppose to take a few hours took all day. 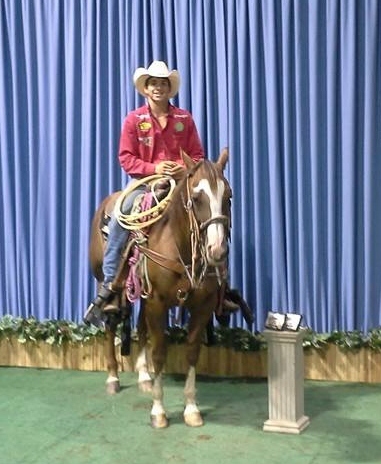 I guess I didn’t mind since I got time to spend with my friends and it was my last State horse show. One the Plus side I didn’t win just one title. I won both that I entered. Today Mom tried playing catch up but it didn’t go to well. We left to get feed at 7:30am so that we could be home by the time the inter got here … We were late. We ended up having to make a stop for gas and a stop for Dog food and a Jolly Ball for Derf. Then when we did get to the house, the intern’s Mom had a flat. I changed her flat and got her back on the road before unloading the feed. 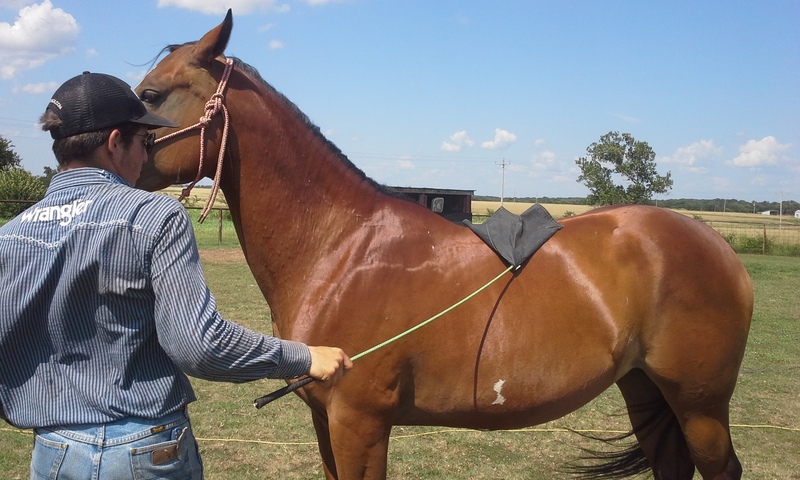 By then it was getting hot and roping was out of the question. Mom tried to get the day back on track but I got a really good laugh when she messed up the cheese she was making because an egg customer showed up and kept her talking … LOL … On the up side they got everything ready for the first Book farm reading program before they went and worked Derf and filled waters. Mom also had us use her new reusable Ice cubes for the water troughs. I will have to tell you all about that experiment in my next post because Mom says that this day has gone on long enough and we are all going to bed early to get back on track tomorrow. These days it is the little things that are keeping me busy. I never realized how my school work kept me on task and made me blog each day. Now without school, I wake up and start my day with all the things I need to get done. I don’t really stop to think about making time to blog. I know it isn’t right but I will try to blog more often and maybe I will get into a better routine about it. As for now I will give you the run down on everything going on around here. At this point I get up and head out to go check and gather cattle. 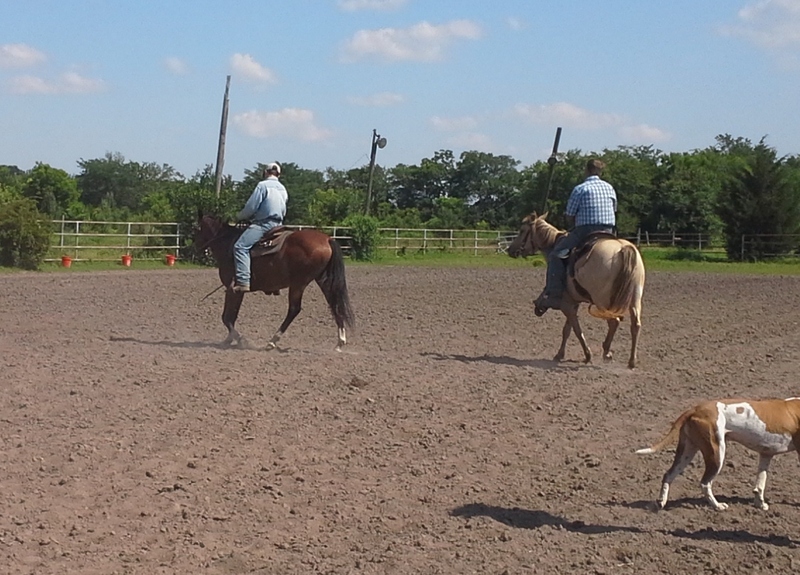 Then I spent the cool of the early morning hours getting in a bit of roping. When I say early morning hours I do mean I get up and get started about 4:30am now. I use the first 30 minutes to get dressed and get around. The head to the pasture. After I rope I set out to do chores and get everything that we call special needs done. Right now we have Coop, who is on a pill and has to have a muscle relaxer put on her legs and she is having another little bout with Dew Poisoning. The pill is done in the morning and the muscle relaxer is washed off then as well but the dew poisoning is a morning and evening treatment not to mention I have to put the muscle relaxer on in the evening. Then there is Derf. He is doing better and we got a good report on him this week. 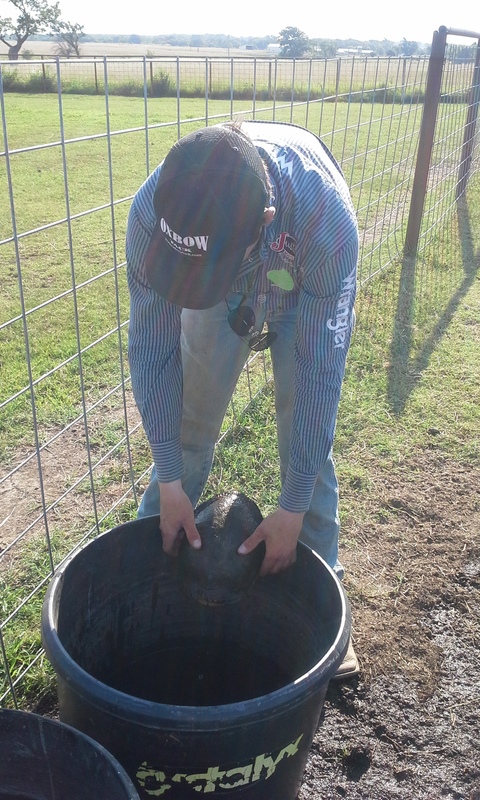 However, he has to have his stall cleaned each day and his hoof treated and checked. Then there is Holly. She is an easy one because she just has to take a shot of antibiotic and I do that in the mornings. Storm will be finishing up her pills in a few days but she has been on them for about 8 days now. She is also a morning treatment. By the time I get everything done it is about lunch time. After I get me something to eat I get to work on what ever is that days project. 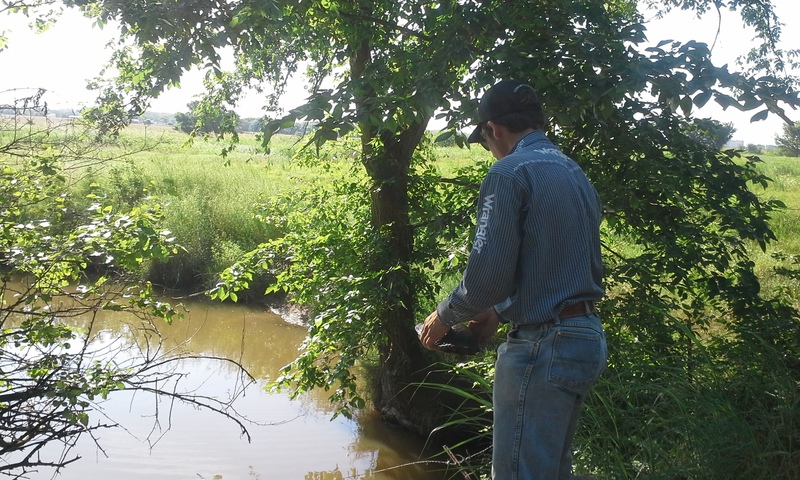 On most days that starts with filling waters about three times a day. The temperatures are in the triple digits and it is humid as well. 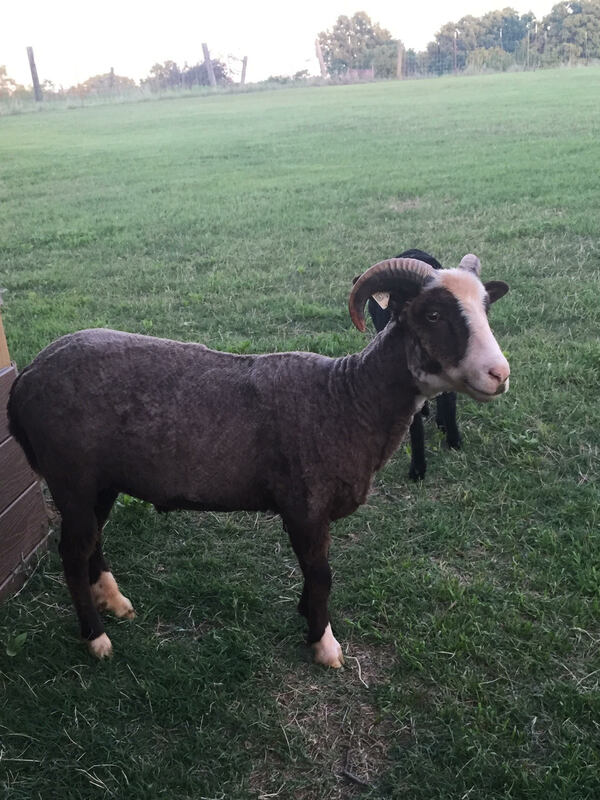 Mom’s daily task of washing, drying and tumbling fleece keeps her busy for part of the day and farm visits take up a good part of it as well. However, there are other things taking place on the farm. Right now we are working to put a small solar kit on the barn. Yup, we are trying to make the Yarn Farm self sufficient. We are hoping the small kit we are installing will be enough to run the radio for Derf, lights when we need them and the fans. In the winter the hope is that we will have enough power to keep the lamb lights going during lambing season. I will try and put together a blog post about the solar adventure just as soon as we get a bit further in the project. Other things that have taken my time are the A/C units that quit us and the 28 year old water heater that is no longer holding water … LOL … Yup it is life but these little things that Mom and I work on do take up much of my time. 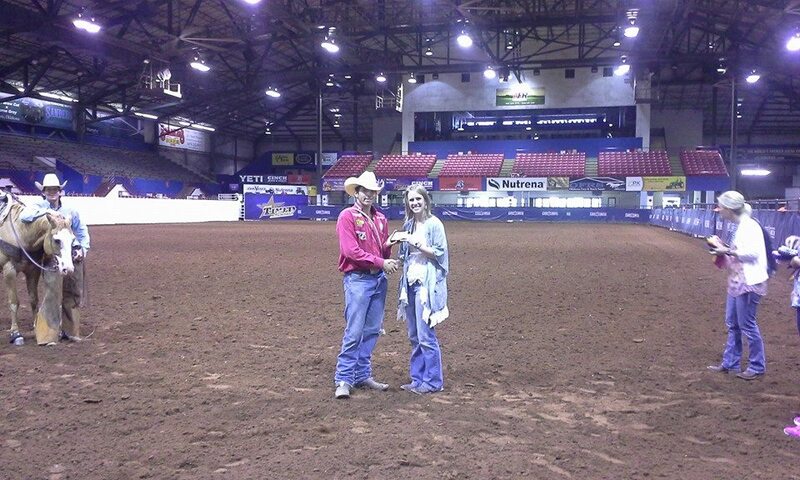 On the weekends my time it spent at the rodeos. I try to make one Friday night, two on Saturday and one on Sunday. Most of the time I do okay and win enough to keep going. Then again sometimes are like this weekend when I had issues and didn’t place at the first three rodeos. I ended up borrowing a bit from Mom to make Sunday’s but won enough then to make it to next weekend. 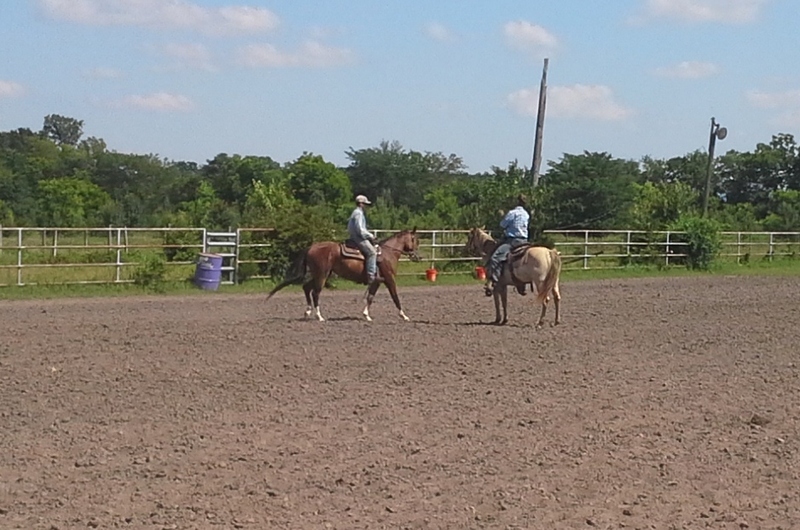 So I spent the weekend roping again. 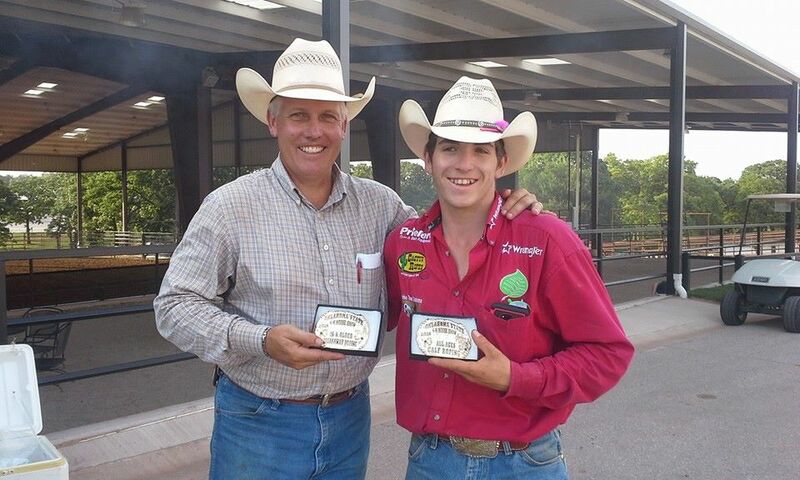 I did really well and Yesterday I won a round and the average and then today I won the rodeo. I did have to take some time to fix fence before I could go but other then that not much happened around here until today. After fixing the fence Mom had me take off the front of the stall in Mr. Zebu’s pen. 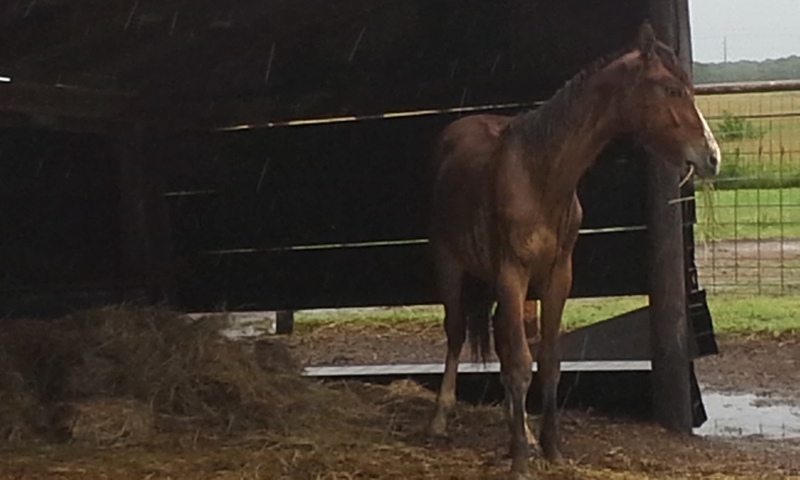 It seems Egor got stuck because he is getting to big for that stall. Then after Dad and I left the storms hit. 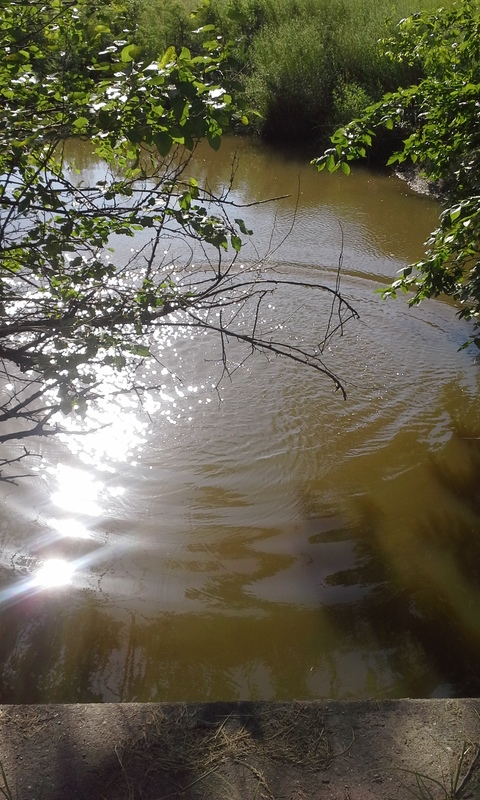 Mom took a few pics that I will share. This is Coops stall and the only one Mom didn’t have fixed when we Got home from the roping. This is the Man stall. There were two sections that went back up pretty easy Mom said. She also said that each piece is only held in place with one nail so we will be adding a few more to make it a bit more sturdy. The other stall that blew apart was Caballo Thunder. 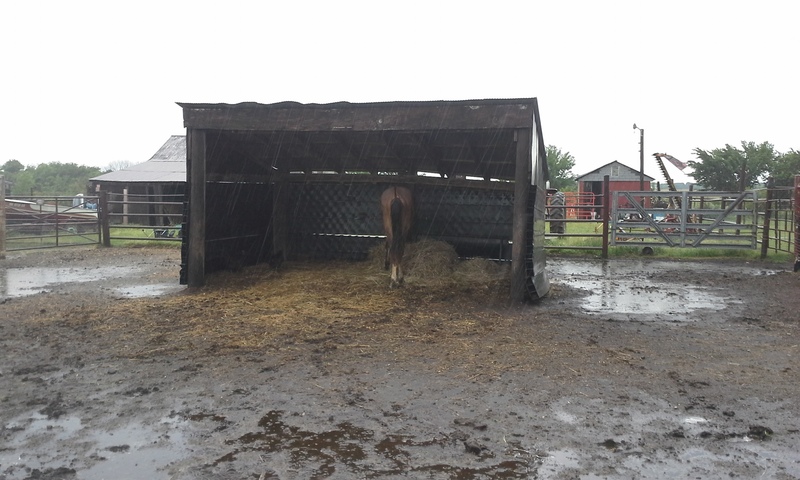 In the worst part of the storm Mom found him outside the stall and that is when she headed out and found all the wind damage. He wanted under the stall but it was making him very nervous with the piece flapping. Mom said she calmed him down, fixed the stall and he went right on in. So today I spent the morning doing a bit of roping. Nothing special really happened until we headed to the trainer to pick up Precious. Then our hearts broke for her. It isn’t that she isn’t fine. It is just that we didn’t like the report we got. I guess I better explain. When we asked our Trainer to work with her we knew she spooked quite often but we weren’t sure why or how to correct it as there was not one single thing that set her off but everything seemed to set her off. Mounting her scared her to death and if we couldn’t mount her we couldn’t really work with her. She seemed comfortable more with Mom then anyone else but still she spooked at anything we introduced her to and it didn’t seem to ever get any better no matter how many times she encountered it. 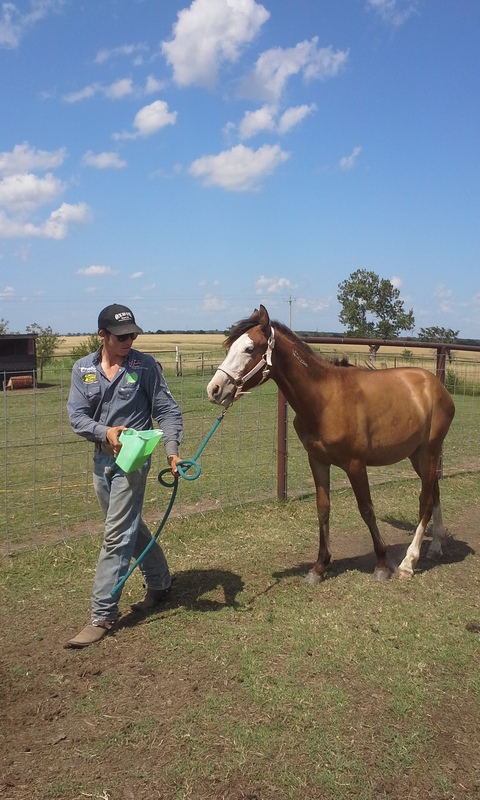 That is when Mom decided it was time to call in Kevin our trainer. Today Mom had made arrangements for me to work with Kevin on my riding a bit when we went to pick Precious up. I took Storm as she has been just a little off. 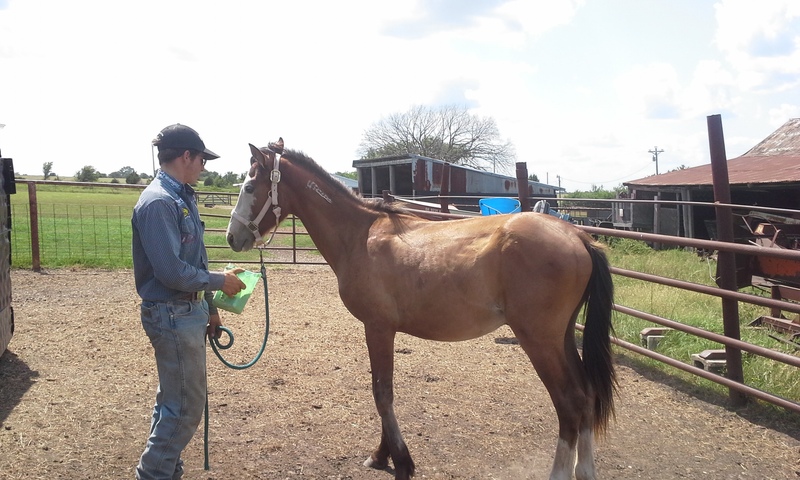 Kevin worked with us and found that Storm’s back leg muscles were a bit sore. Mom and I had tested her but she hides it so well it took even his trained eye an hour to figure out her issue. So he had time to use Precious to teach me. Now for the bad/good news. Precious is still spooky. The good news is bad news though. Kevin found out why she was so spooky. 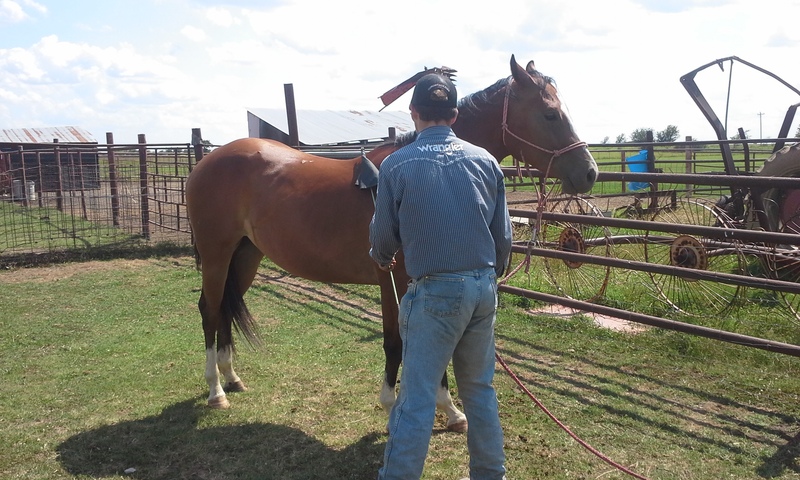 As with any good trainer Kevin spends time getting to know a horse and building trust by grooming them. However, Kevin doesn’t just brush them. 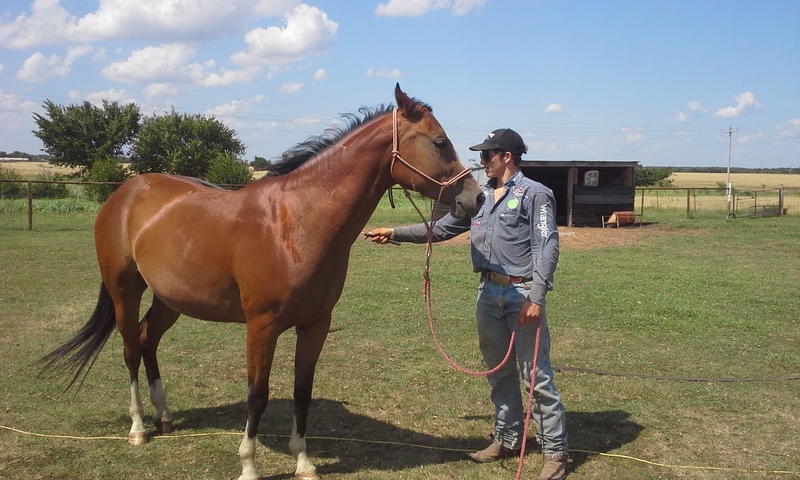 He is a professional show horse trainer so they get the full treatment. 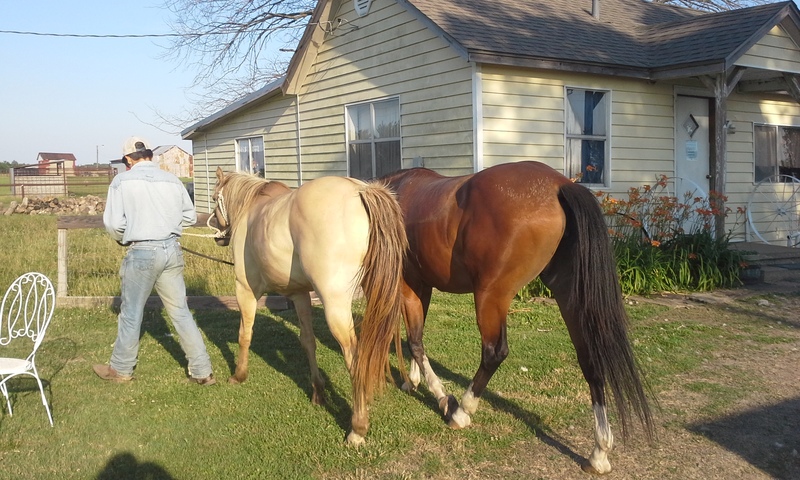 Their mane gets shaved between their ears and they tail gets shaped and her feet clipped and just about everything but her hooves painted … LOL Anyway, as Kevin clipped and primped her, he didn’t like what he found. There are scares behind her ears and those perfect white marks under her chin are not God’s work but scars as well. These kinds of scars are mostly found in older horses that have been incorrectly trained with what is called a Brain Chain. Most Brain Chains are homemade and are not really safe if not used correctly. This photo is of a correctly used Brain chain. As you can see the chain goes behind the ears and in front of the ears. 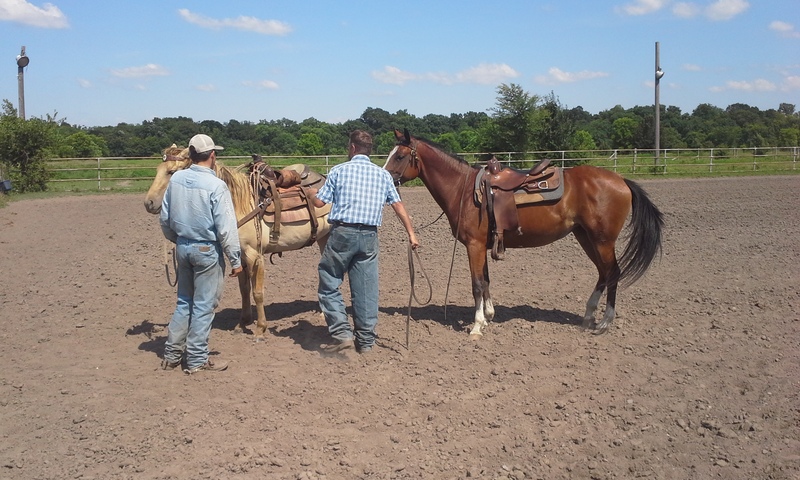 While the rope goes down between the legs just tight enough to train the horse to keep the head at the right height for the event in which it is being trained. 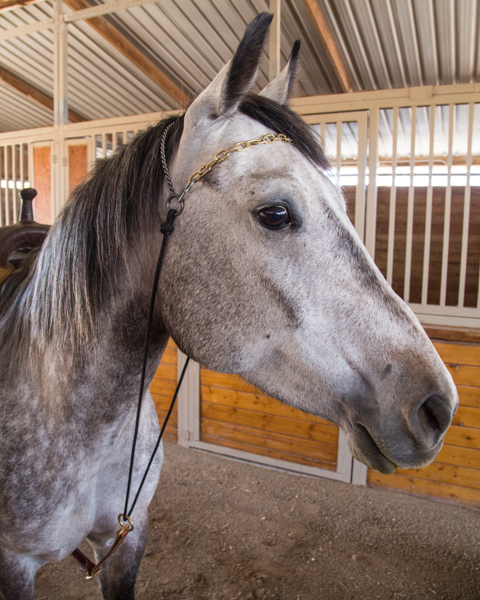 The first problem is that most homemade Brain Chains have something that holds then in place under the horse’s chin. This is not the correct way to make or use one. Another issue is that Precious is to young and not so advanced in her training that a brain chain should have ever even been on her head, let alone used to train her. Used incorrectly in all to many cases and you end up with the scares found on Precious. As Kevin worked with her he also found that it wasn’t a thing upsetting and spooking her but instead it is a motion. The motion is simple … it is a hand that rises and falls. You can’t raise your hands to grab the saddle horn to mount her, you can’t raise your hands to put the bridle over her head, You can’t raise a hand at all without upsetting her. So Very Sadly, this can only mean one thing. None of us want it to be true. None of us wanted to really even say it. This fact is a motion that brings Mom to tears and breaks her heart is the fact that Precious has been beaten. Not just corrected or occasionally hit but … BEATEN. Beaten in anger, beaten to the point that a brain chain cut into her head and chin as she tried to react to that pain. Beaten to a point that she was probably screaming in pain and confusion. Beaten to a point that right now she can’t even be patted in praise without getting really upset. Mom isn’t happy and her and Kevin both agreed that they neither one know what happened or if she will ever really get over it. Kevin says that she does flash back from time to time and it scares her. So what is the Good news in all this? Well, the same man that figured out Precious’ pain is the same man that wants to bring her joy. Kevin really likes Precious. So much so that if we can’t get her to a point of being a somewhat normal horse where she can at least have a job of some sort, He wants her. Mom and Kevin both agree that she will NEVER – EVER – Be beaten again. She will either live our her days with us or him. She is now GUARANTEED a wonderful home for the rest of her life. No matter which home she resides in. 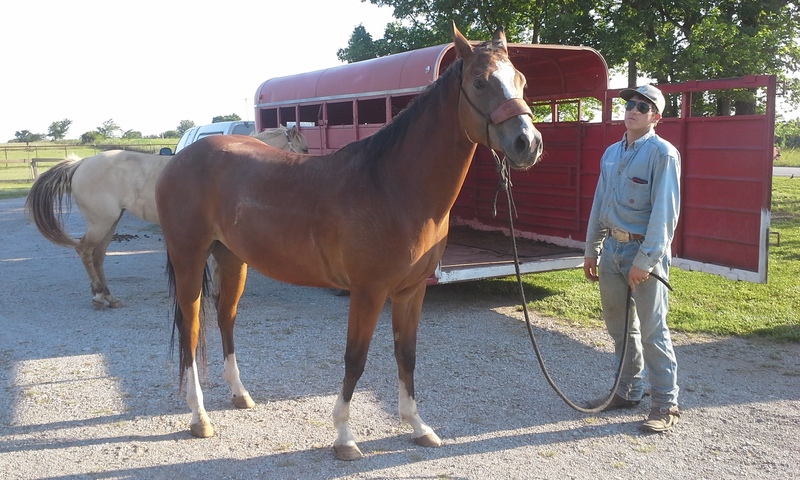 Some how Mom and I both get the feeling that for Kevin this is his first true rescue horse that he has worked with. Precious wasn’t just abused but she was emotionally abused and she was under weight as well. 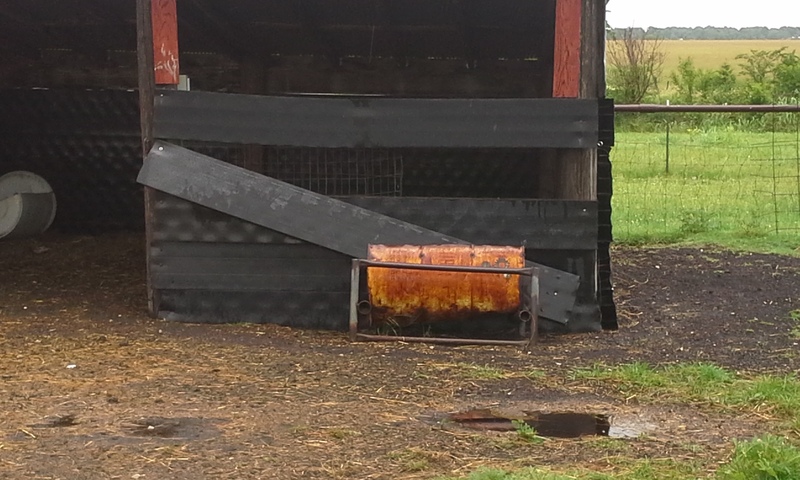 The reason we think this is Kevin’s true first abused horse is simple. When we took Precious to Kevin he asked several times if she was breed. We assured him that she had been ulta-sounded and that she was not. He later admitted to Mom that he has seen under weight horses but never to the tune of 500lbs before. The first way that a horse regain weight is what we call hay belly and that is what Precious had when we took her to him. 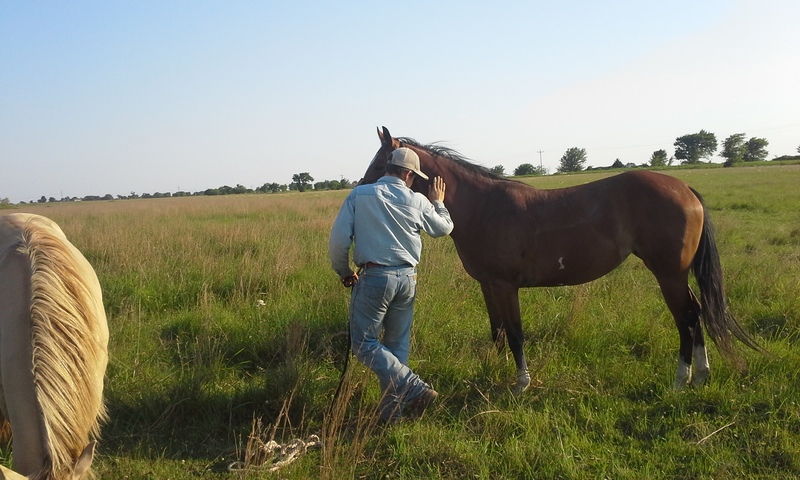 He also admitted that he spent the better part of an afternoon watching to see if he could see a baby moving in her belly … LOL If you have never seen a horse regain large amounts of weight you, and horse professionals alike, would think that a horse might be with child as it regained it. Top all this off with the fact that he figured out that Precious had been beaten and the scars he found and I think it really got to Kevin. I think his heart broke just the same as Mom’s and Mine did for her. Mom always tells me the first rescue is always the one that sticks with you, No matter how many you do. This leads us to believe that Precious will never be very far from Kevin’s heart or mind. Today Precious came home. After 30 days of hard work with Kevin, it seemed only fitting to turn her out to be a horse for a few days. 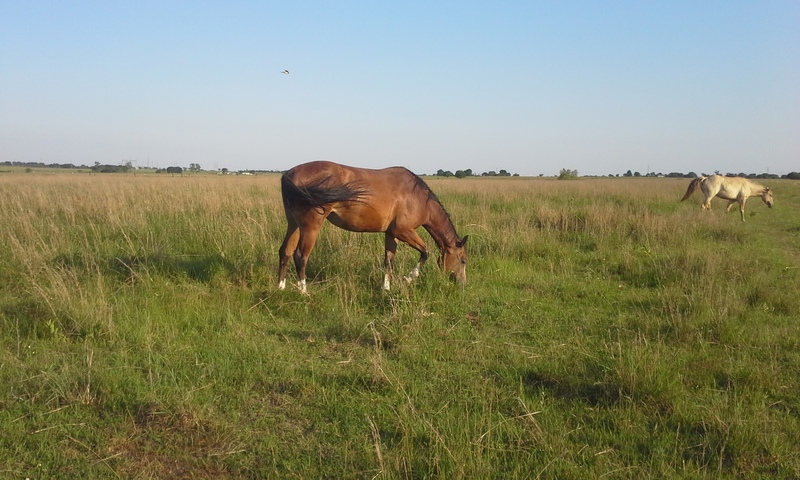 To let her graze and run and play. 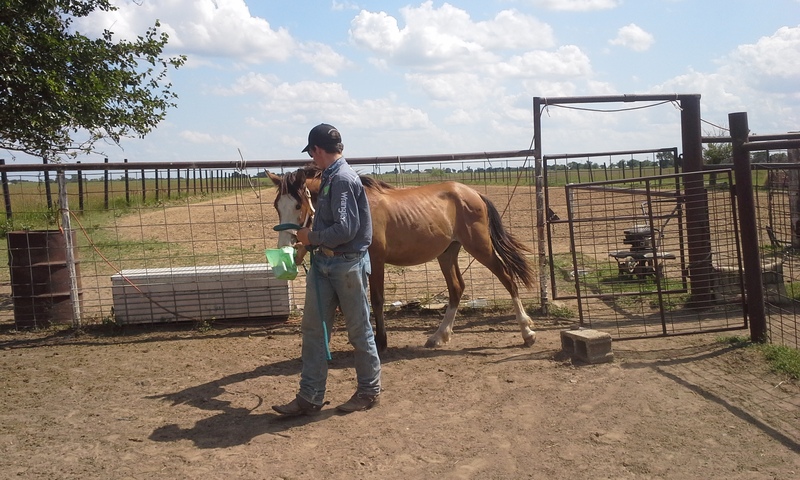 Since Storm is sore we also let her go out to graze and be Precious’ buddy for the next week as well. Doesn’t Precious Look wonderful. 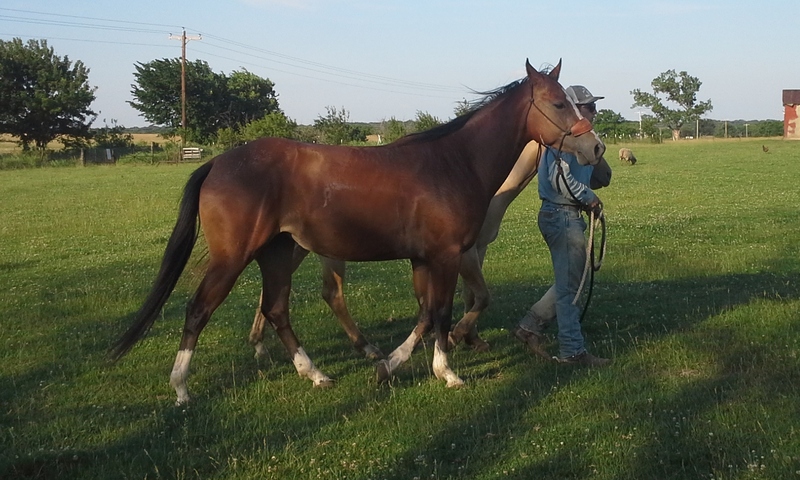 She is a far cry from the pitiful horse we brought home about 6 months ago. She will continue to get better. I just hope that she can now start to heal on the inside as well. 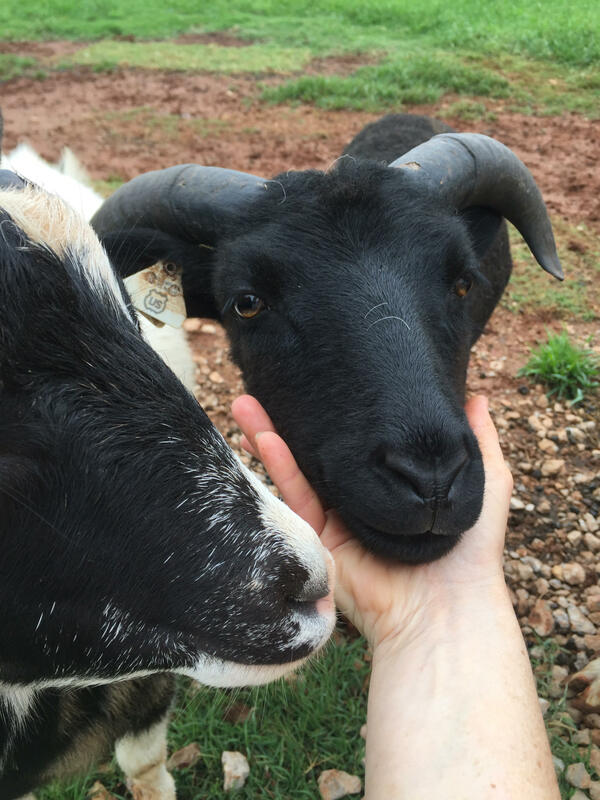 For the last week nothing has really happened out of the ordinary here on the farm. We had a few things that didn’t go right but nothing major. We also had a few things go right but again nothing really surprising. For example one day last week, a nest of chicken eggs was laid in the front flower bed and since we didn’t know anything about them they were left in the heat so long they exploded. The Smell by the front door was horrible. Of Course it has to happen when we had someone stop by so that was kind of embarrassing but I watered the nest down and cleaned it up while Dad took the other old eggs and got rid of them. Another day The farm Got some thorn-less blackberry from the Community Garden to help make a better fence in the orchard. We got 5 starts and we planted them so that they will be all over the old fence in the orchard making it a better fence to keep the Orchard at least Kind of fenced. We also had a wonderful farm visit with the Grandkids of another fiber artist. We think it went well and they posted a ton of pictures and according to Grandma are already planning their next trip to the farm. The very next day our Intern returned for the summer. 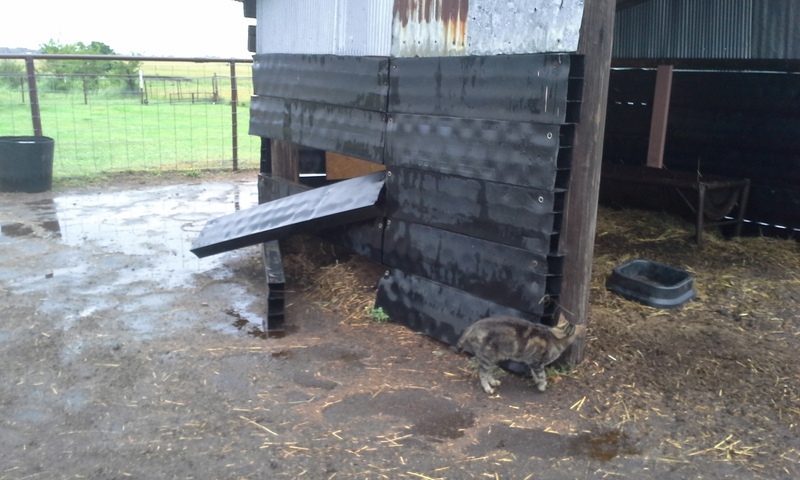 She got right in and made a pen in the barn to keep the chicks safe before helping us work the sheep and goats. Everything was wormed and the lambs and kids got their second CDT shot as well as the man pen was vaccinated. She even returned again on Monday and helped get everything set for this Friday’s Fire Flies and Star gazing event. 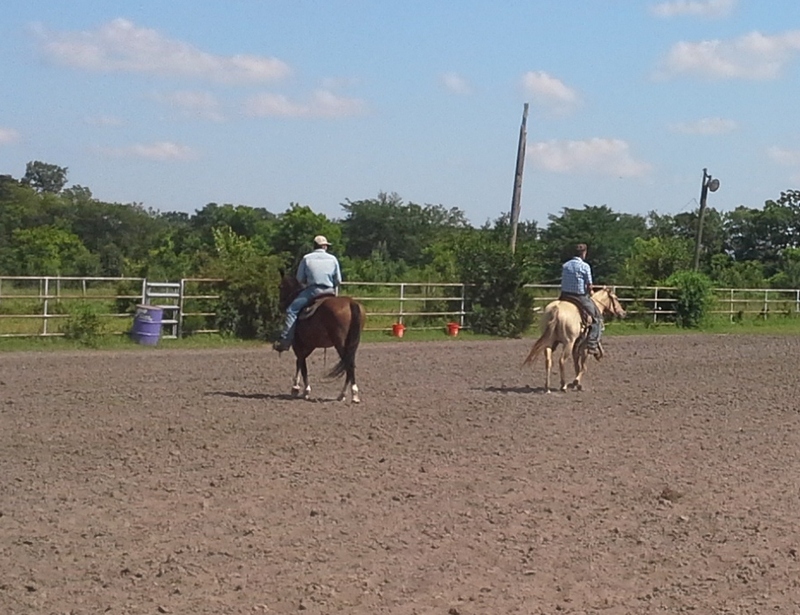 I roped Thursday at a roping but things just seemed off and I couldn’t get it together. 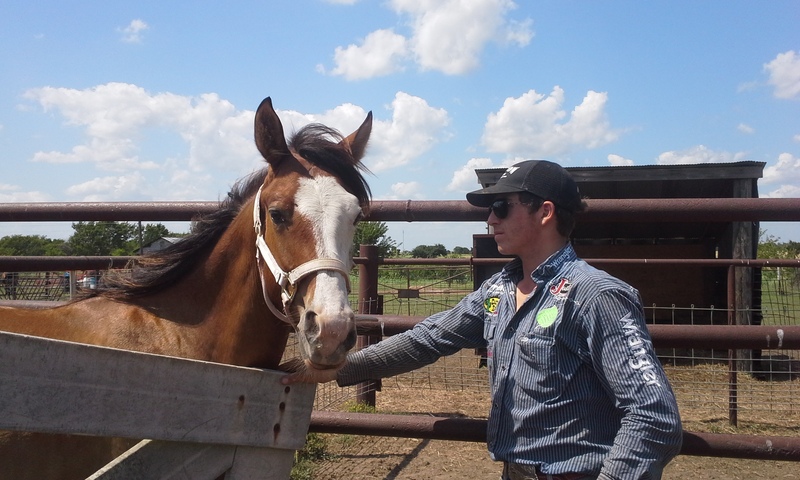 I decided that I would spend this weekend in the practice pen and get myself right before entering anything that costs money. 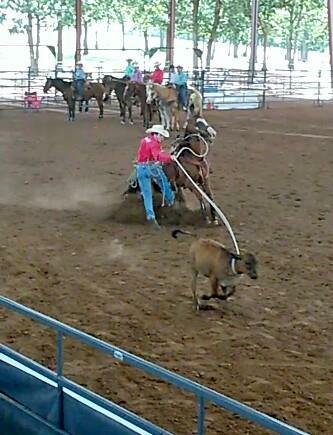 Each day I have spent the cool of the mornings roping for about 2 hours. This is also a good thing since Mom’s truck needed an easy week before it made it’s way back to the mechanic … We will get it back this evening when Dad gets home. 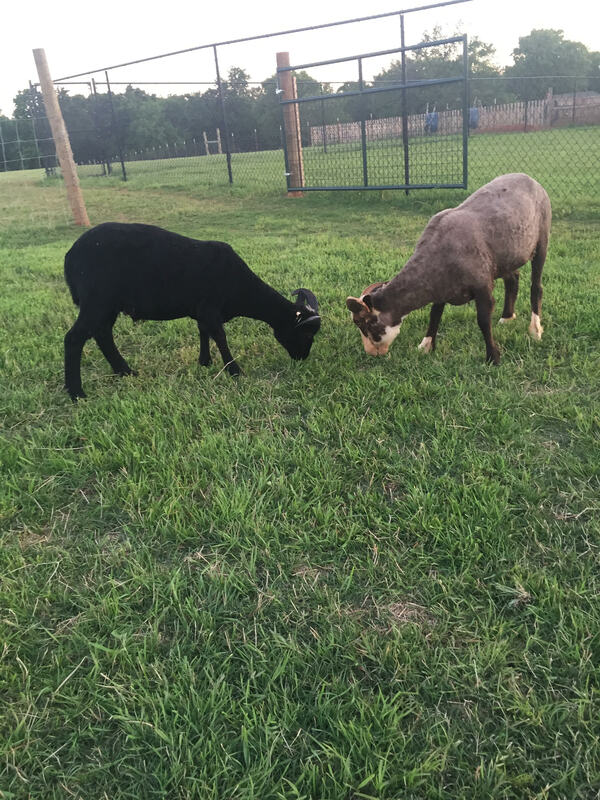 I named the brown one Milton…he has always been the bold one, quick to come up to you for food, but still very skittish and quick to instinctively bump you with his head and run away if you move to quickly. She also included photos I thought you all would like to see. The Brown and white looks just like his Daddy – King Panda – What do you think? ?